RSVP at http://LACLJ.eventbrite.com by October 22. This program will engage attorneys across practice areas to consider the range of criminal and civil legal remedies that may be available to survivors of domestic violence and sexual assault. 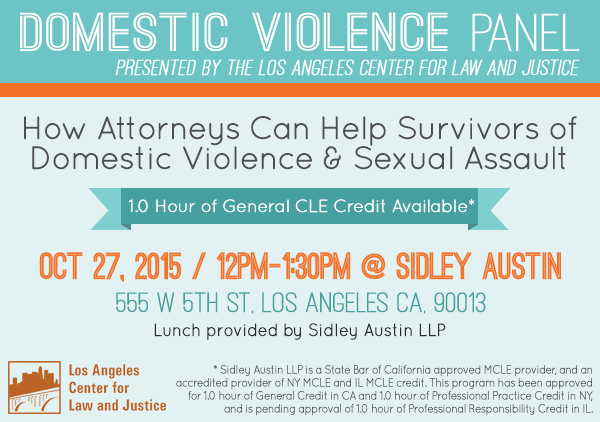 The panel will discuss trends of domestic violence in Los Angeles, services available to DV/SA survivors in Los Angeles, and how attorneys can help survivors of domestic violence and sexual assault. The panel will also discuss practice tips and practical considerations involved when a client is a survivor of domestic violence or sexual assault. Lunch will be served at 12pm. The Panel will begin at 12:30pm. For more information and to RSVP, visit http://LACLJ.eventbrite.com. If you have any questions regarding the event, contact LACLJ External Relations and Pro Bono Supervisor, Jenny Farrell, at jenny@laclj.org or (323) 980-3500, ext. 14.